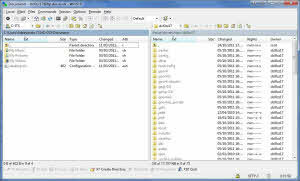 WinSCP is a SFTP client acclaimed, FTP and SCP open source. With an interface similar to Explorer or Total Commander (you can choose between the two), WinSCP is fast and rock solid. After entering the connection details and save the profile, click WinSCP connect to access the file server, if it supports SFTP or SCP, transfers will be conducted through a secure tunnel. Operations available on WinSCP otherwise, are the same you'll find similar programs. You can move, copy, delete or rename files, synchronize folders and change permissions to read, write and execute. Very interesting is the Commands menu, which brings WinSCP useful features such as directory comparison or search for files. There is also a shortcut to PuTTY, the SSH terminal celebrated.